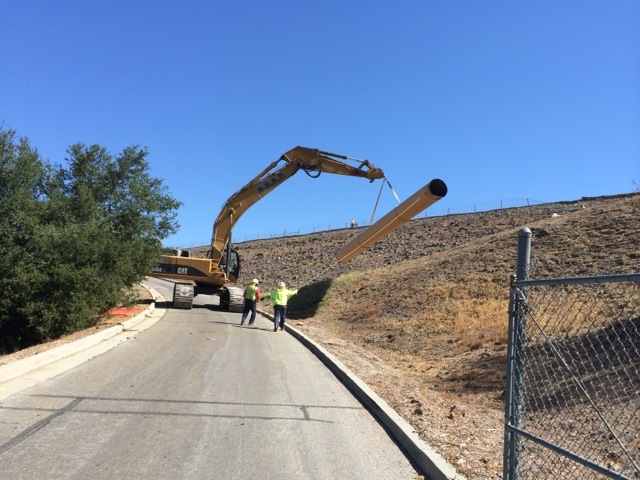 This morning, workers at Las Virgenes Municipal Water Districts Westlake Village reservoir, above Three Springs, lost control of a 40 foot long, 36 inch diameter pipe on the upper access road along the reservoirs edge. The pipe shifted and dislodged from a carrier truck (with many pipe segments loaded) while workers were removing a different segment of pipe. 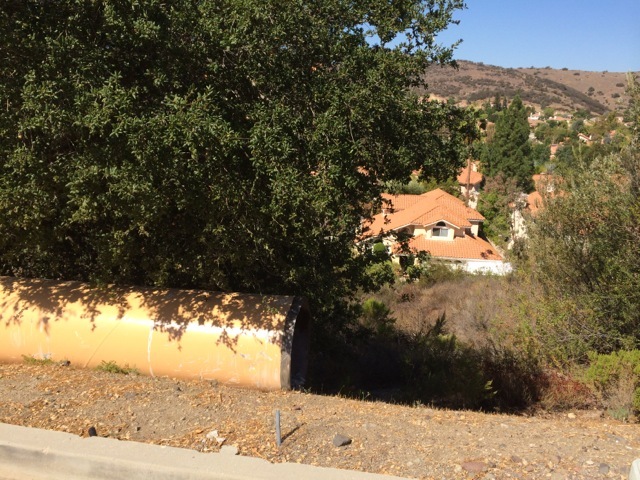 The dislodged pipe was not properly secured, fell off a truck, rolled down the embankment slope at speed, crossed the lower access road and just before it entered a residents property, hit a large oak tree. The pipe, fortunately, hit the tree centered rather than at an edge, or it would have continued down the hill into the house below. There were no other significant obstructions beyond the tree before it would have hit the house. Other than shaken nerves, there were no injuries reported. The pipe, made of steel and lined inside and out with concrete, weighs thousands of pounds (were hearing estimates of 5000 pounds or more). 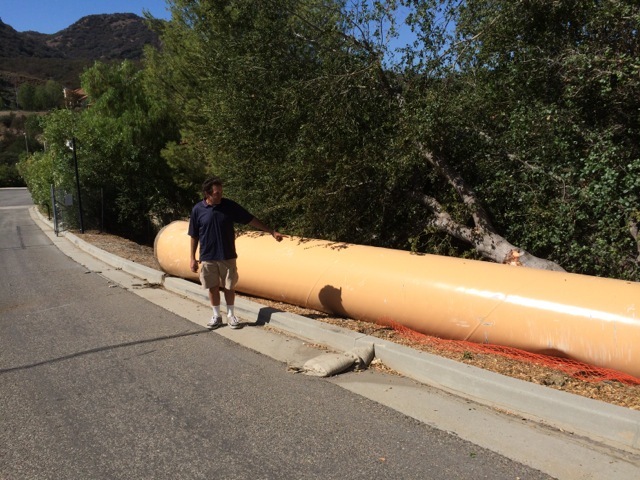 The pipe is part of the ongoing project to build the controversial 5 million gallon water tank next to the 3 billion gallon Westlake Village reservoir. Workers were reportedly instructed to “clean up the site as quickly as possible,” and the pipe was removed less than an hour after the incident. According to LVMWDs general manager, David Pedersen, pipe work has now stopped, and the contractors are preparing an incident report, as well as a plan and procedures to prevent another pipe incident from happening. This represents the third serious incident related to LVMWDs Westlake Village tank project. Two prior incidents were a near miss head on collision on Three Springs Drive, and another near miss t-bone type accident involving construction traffic.